LOUER MAINTENANT POUR L'ÉTÉ! Ocean Edge est situé sur une plage privée, offrant une vue panoramique sur l'eau et les dunes de sable célèbres de l'Île-du-Prince-Édouard, depuis le pont enveloppant, la grande salle blindée ou le verre dans le «belvédère» au niveau supérieur. Notre maison de plage est située au bout d'une péninsule tranquille sur le bassin de Darnley, Malpeque, Î.-P.-É. Ocean Edge est une maison de 2000 pieds carrés entièrement équipée pouvant accueillir 8 personnes. Non seulement Ocean Edge est situé sur un acre de terre, la maison est spacieuse, offrant tout le confort de la maison. Les options sont sans fin - profitez de cette escapade de l'océan privé tout en écoutant les vagues sur le rivage. Laissez l'odeur de l'air salé frais vous emmener à un million de miles de distance, tout en étant proche de plusieurs des commodités les plus recherchées de l'île. Mettez votre kayak de mer dans l'eau à quelques pas du pont arrière, peignez votre propre plage pour des coquillages ou d'autres trésors, faites du vélo à la célèbre plage de sable du parc provincial Cabot ou Thunder Cove à quelques kilomètres. Jouez à un tour de golf ou regardez votre repas de fruits de mer enlevé du bateau dans une authentique cabane d'huîtres de l'Île-du-Prince-Édouard juste en haut de la route. Enfin, Kensington est à seulement dix minutes, offrant tout le nécessaire pour rendre votre séjour agréable. Nous espérons vous donner une semaine pour vous échapper. Nouvelle douche extérieure Marque entièrement équipée, une pelouse acres menant à la plage. We really enjoyed our week at Ocean Edge this August. 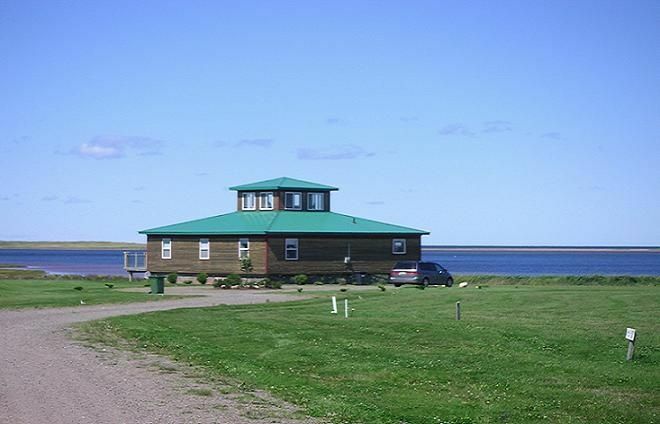 Spacious and private with high ceilings, decks and views, this cottage looks out on Darnley Basin part of Malpeque Bay. Our family from near Ottawa and Saskatoon were there for a reunion with relatives from England, Calgary and Cape Breton staying in three other VRBO cottages near by. Our house was well equipped and organized with a large kitchen - great for family dinners. Our older son got to sleep up in the loft. We recommend the outdoor shower. We explored the area and found the best beach of all, Thunder Cove with dunes and sandstone formations. Some of us went to the Anne of Green Gables Musical in Charlottetown, some to the Haunted Mansion and some went deep sea fishing. We did beach walks and enjoyed the New Glasgow Lobster supper (get reservations). Lots to do, but leave time for just enjoying the peace at Ocean Edge. This was a great place to unwind with family and enjoy the surrounding area and beaches. I would like to take this opportunity to thank you on behalf of my family and myself. We truly enjoyed spending a week at your cottage. The house, the beautiful view and the quiet of the area was only surpassed by the amazing sunsets we were able to see directly from the deck or from the lobby at the second floor. The no wifi connection gave my family a reason to spend more time playing board games or outdoor games. I don't remember last time when we talk so much each other. Please do not change this in the future. Let the people enjoy the nature and connect together. Shelly and Joe, we will definitely come back to your cottage one day and we will recommend it to our friends. We would love to have you guys back again in the near future Silviu! Thanks for the kind words. Have a wonderful rest of the summer. If you are looking for some well deserved downtime and an opportunity to enjoy all PEI has to offer, this home is a great choice. It was very clean and provided everything we needed for our family to stay comfortably. The three bedrooms were spacious, the kitchen was well equipped, the bathrooms and showers were great and the outside was amazing. The beach was right there out the sliding glass doors and we all enjoyed sitting on the large decks watching the sunsets and herons who live along the neighbouring inlet. We dealt directly with Joe, the owner, who was very helpful arranging our last minute reservation. We will certainly return. We are per-free unless discussed ahead of time.